Easily mark you guests glasses at parties and events with this set of 12 wine regions wine glass charms from True Fabrications. They feature a durable multi-colored plastic construction and each of the charms has different wine regions with multicolored banners and maps in the background. 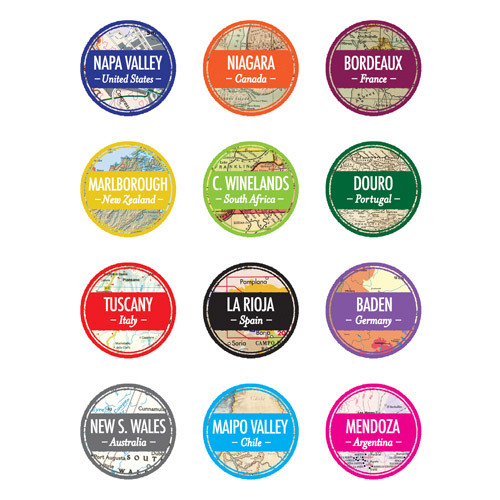 Regions include Napa Valley United States, Niagara Canada, Bordeaux France, Marlborough New Zealand, C. Winelands South Africa, Douro Portugal, Tuscany Italy, La Rioja Spain, Baden Germany, New S. Wales Australia, Maipo Valley Chile, and Mendoza Argentina. These static-cling charms will stick to your glasses easily and peel off without leaving any residue. Able to fit any size and style of glass, this set of 12 charms is reusable.